This option allows author to view the questions currently present in the database. 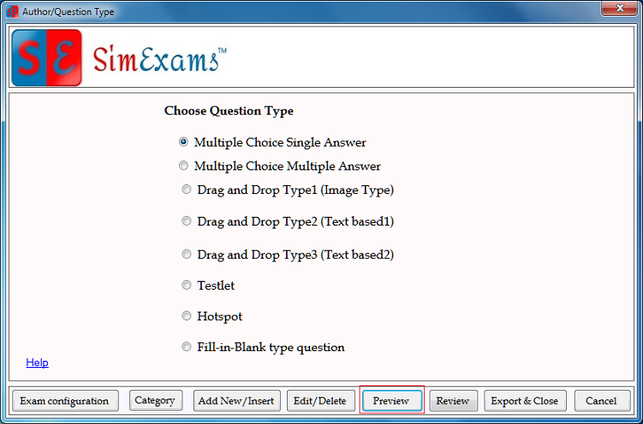 This option is useful for author to view how the questions entered by him will be shown in CBT Software- Exam Engine. To use this option click on "Preview" button in "Author/Question" screen. All the selected questions will be displayed sequentially in the Exam window. Previous : Use this button to view previous question. Next : Use this button to view next question. Flash Card : Use this button to view explanation (if provided) for this question. Close : To close the exam preview.